Arlington officials expect a mix of across-the-board service cuts and tax rate increases is the surest way for the county to tackle its widening budget gap next year. With a funding gap that could ballon as large as $78 million for fiscal year 2020, County Manager Mark Schwartz has repeatedly warned that some tough times are ahead for the county government. 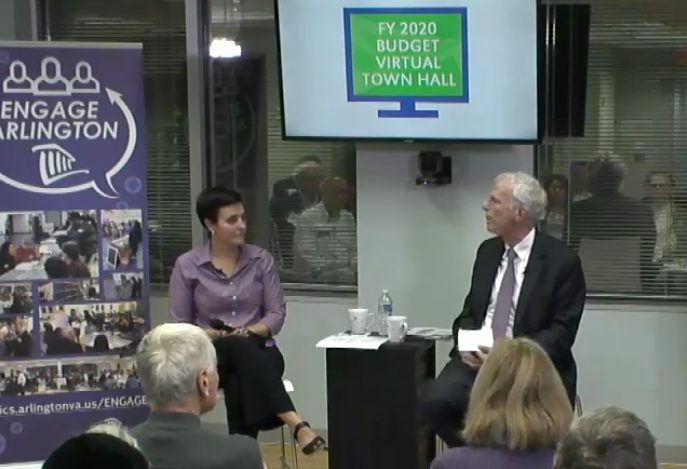 He repeated those gloomy projections at a budget-focused town hall with community leaders last night (Wednesday), noting that factors ranging from swelling school enrollment levels to dwindling county revenues to increasing Metro funding obligations will all squeeze county coffers once more. The question Schwartz (and soon enough, the County Board) is looking to answer is: how should Arlington balance cuts with new tax increases? The answer will set the tenor of the Board’s upcoming budget deliberations, particularly when considering that the county has avoided tax increases in recent years. Nevertheless, Schwartz believes the county’s funding squeeze is such that simply slashing expenses can’t be the only answer. In addition to opening three new schools in the coming year and digging deep to cope with money pulled away from the county as part of the new Metro funding deal, Schwartz says the county needs to get creative to address the new costs of public safety pay increases the Board approved last year and new expenses associated with the state’s Medicaid expansion. He suggested that both the real estate and personal property tax rates could go up to address those budget concerns, though it’s difficult to know by how much just yet. A great deal depends on the budget the school system delivers to the county, considering that initial estimates suggest a $43 million budget gap from Arlington Public Schools alone — Schwartz encouraged the School Board to consider the hard question of bumping up class sizes and formulating a “revenue-based budget versus a needs-based one,” but the final decision will rest with APS leaders. Eventually, Schwartz expects that the county’s office vacancy rate will shrink to a point where Arlington isn’t constantly facing such pressures. He noted that the rate has shrunk from 20.8 percent in 2015 to 18 percent as of last month, and as “outdated buildings” in neighborhoods like Crystal City are increasingly refreshed or converted into apartments, he expects the county will soon enough be back on sound financial footing. In the meantime, however, he urged a focus on more than “nibbling a little bit here and there” and a real focus on “looking at how we do things” to bolster the county’s financial picture. While the sentiment among county taxpayers is another story entirely, the town hall participants, at least, seemed broadly receptive to paying a bit more to avoid drastic cuts.